Chalk Talk: A Kindergarten Blog: Hip, Hip, Hooray! It's the 100th Day! We bought shirts from Really Good Stuff that said "our students are 100 days smarter." We built something using 100 objects. We thought of things we wanted 100 of. We read The Little Red Hen Makes a Pizza and made a pizza with 100 toppings and 100 pieces of cheese. We made a chain with 100 links. We had 10 links of 10 different colors. We made 100th day snack mix with 10 chocolate chips, 10 fruit loops, 10 marshmallows, 10 M & M's, 10 cheerios, 10 gummi bears, 10 animal crackers, 10 pieces of popcorn, 10 Goldfish crackers, and 10 pretzels. We made ladybugs with 100 spots. We made 10 sets of 10 objects using Pixie in the computer lab. We made a caterpillar that was 100 circles long and that ate 100 foods. We painted 10 sets of 10 dots to make our 100th day crowns. 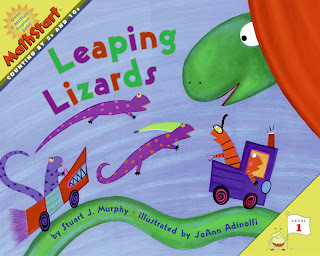 We read the book Leaping Lizards and made our own book about the leaping lizard show using 100 lizards. Thank you so much for your awesome ideas! I really needed this and you really just made my planning for the 100th day that much easier. You are WONDERFUL!!! Hai, my name is Linda Willemsen and I'm a teacher from Holland. 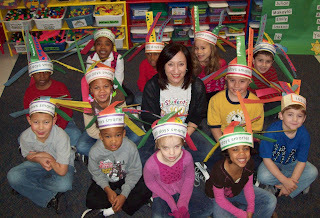 I write a book with lessons for Kindergarten I saw you idea of celebrate the 100 days of school. Very nice! We don't do that in Holland. I have a question. Will you send me the original picture of the 100th Day caterpillar? So i can use it in my book! My email is lindavandeweerd@hotmail.com Thank you! This is so cool. 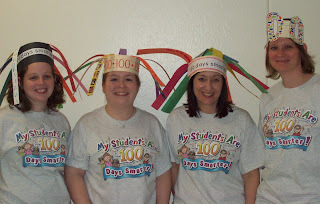 Who knew you could do so many fun activities on the 100th day of school. I like the chain link activity and the snack idea. Best activity is one you can learn from and eat at the end. Thanks for sharing!